Global Volcanism Program's Weekly report - By the Smithsonian Institute and USGS. If you load "Current eruptions" for example, and open the folder in the Places pane, you will find "Merapi, Java, Indonesia" listed. 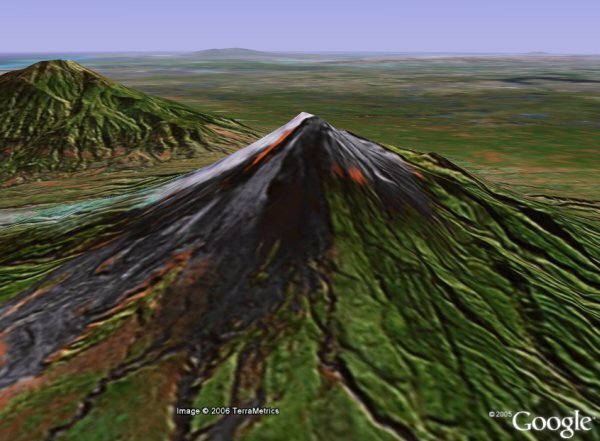 Double click on it to fly to Merapi and see this colorful satellite photo in 3D. Open the placemark and you will get details and links to perform a Google Search or a Wikipedia search for more information. Very nice interface! Herminator was also the creator of the World Heritage sites which are now part of the GE Community Showcase. It's called a strato-volcano, as opposed to a shield volcano such as Mauna Loa on Hawai'i. BTW, Mauna Loa is th largest mountain in the world. Notice I did not say highest above sea-level; that distinction still goes to Mt. Everest. However, Mauna Loa extends from the sea floor to almost 14,000 feet above sea-level. It's total height, as measured from its base, is about 32,000 feet. It is also the most massive mountain on the planet. Mauna Kea comes in at second place for those distinctions.